If you’re just finding this post, know that the Rug Doctor e-coupons listed here are not currently available. However, I’ve often found Rug Doctor coupons online at Coupons.com, or you can scroll down to find out how to save on buying one of your own! You can find these e-coupons quickly by selecting the “Paper Cleaning & Home” category. 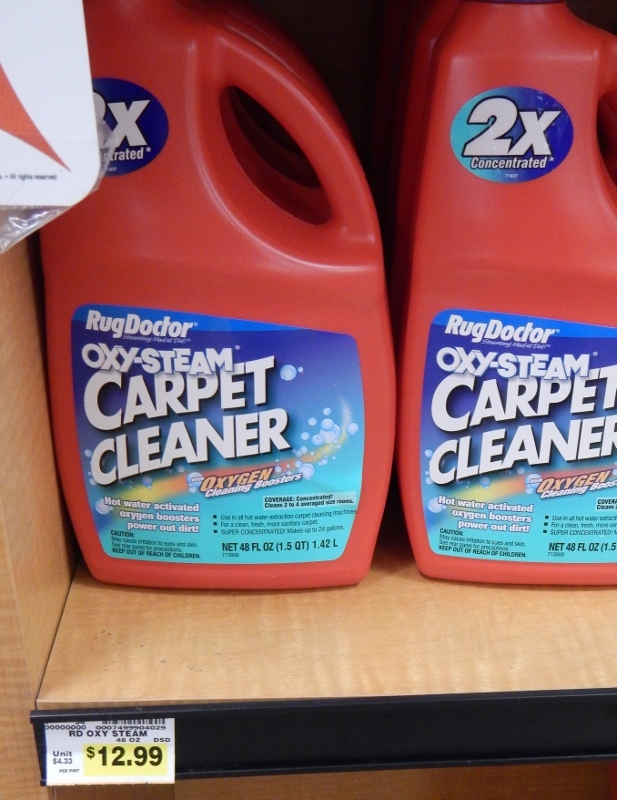 At my store yesterday, the least expensive Rug Doctor cleaner I could find was priced at $12.99. You’d pay $9.99 after the e-coupon. It looks like a one-day rental of the most basic machine is $26.99 – so you’d pay $19.99 after the e-coupon discount. If you really want to maximize the deal, make sure to load the 2X fuel points e-coupon and pick up your rental on a Friday or Saturday through July 27th! I rented one of these bad boys several months ago and was surprised by how easy it was to use – and how quick the process actually took. Before picking it up, make sure to clear your carpet spaces and vacuum thoroughly. Here’s a final option that may be worth considering for a few folks – actually just buying a Rug Doctor! I found this one on Amazon for $398 (used options start at $331). While you might balk at that price, it may actually be a cost savings over getting your carpet professionally cleaned every 6-12 months. Another option may be to “share” it with a friend or family member and split the cost. This model has an average 4.5-star rating after 128 customer reviews. I have owned steam cleaners before, but nothing has worked quite as thoroughly as a Rug Doctor for me! So, I’d love to know – how often do you clean your carpets? Do you rent a Rug Doctor, pay a professional, or own a different steam cleaner? Please leave a comment below!